It’s no secret that industries are changing, and fast. Between millennials entering the workforce and rapid advancement in technology, many companies are feeling forced to evolve. However, the American Land Title Association (ALTA) recognized and embraced the potential of change. With creative guidance from LAI Live, and a sassy little robot named VAL, the 2017 ALTA One Show was a testament to their new outlook. LAI Live designed a completely custom fabricated stage set with four screens, used throughout the programming to animate VAL’s robot voice, sponsor graphics, live polling, and more! 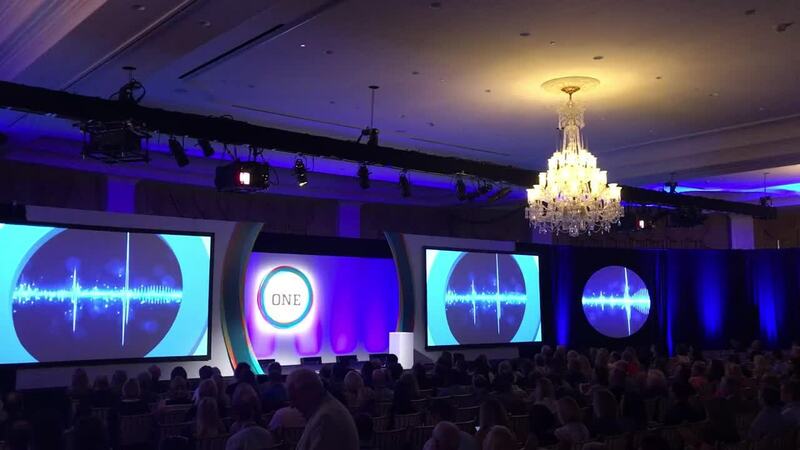 The round screens flanking each side of the set were perfect for showcasing the one-year anniversary of the ALTA One logo through a rotating animation. Programming included the debut of ALTA’s ‘Swim with The Sharks’, a Shark Tank style session where industry leaders pitched ideas to the judges, though the audience determined their fate. There were keynote speakers on leadership, panelists discussing creativity in the workplace, and even a guitar-playing comedian straight from the Las Vegas Strip. Outside of the general session programming, LAI created an interactive, black-light graffiti wall where a local artist interpreted attendee’s industry words into art. The exhibit hall showcased additional LAI elements, including eight-foot high glowing sponsor towers, with graphics changing throughout the week. And let’s not forget the 70” vertical monitors sharing social media feeds and, oh yeah, about twenty education sessions. Helena Lehman is responsible for building the company’s business in content marketing strategy among its clientele. With more than 15 years experience as an event producer, Shannon has produced everything from multi-million dollar, nationally-televised events to a nationwide roll-out of intimate, in-person experiences. Elizabeth has over 10 years of experience working with LAI customers in all aspects of our business. She maintains production schedules, manages workflow and tracks deliverables. Throughout the past 10 years, Katie has worked globally in scenic and lighting design, technical production, and event management.